The Halloween season is a fantastic time to do some truly spooky science! 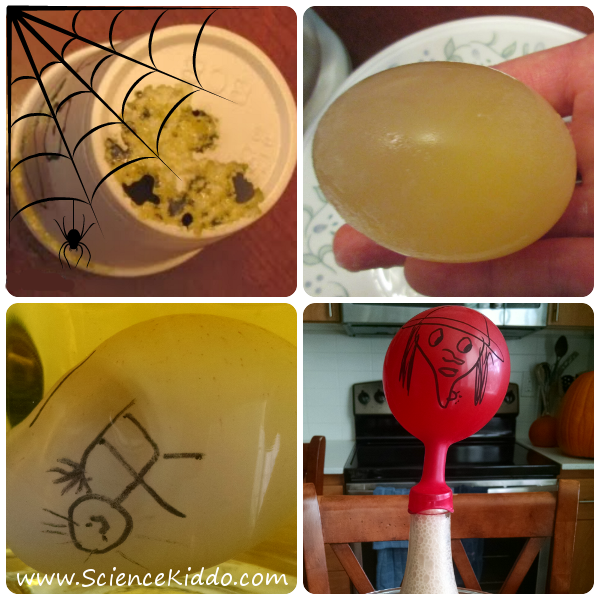 Here are some our favorite halloween science experiments and activities to do with kids. Make your own gel clings out of a few simple kitchen ingredients! This fun craft rolls science and art into one as you observe the viscosity of the liquid gelatin and how the gel clings get thinner as the water evaporates after a few days! Learn polymer science by making your own slimy, ooey, gooey GAK using just a few simple ingredients. This is a fantastic sensory play experience for the kids as they knead it, roll it, pull it, make bubbles, and pop it! carbonate their own juice, and more! Watch sugar crystals grow while making a creepy treat! These vampire rock candies may take a few weeks to grow, so best to get started on them soon. Watch a styrofoam cup literally disappear before your eyes as the compounds in citrus essential oils dissolve it! Learnall about osmosis as you dissolve the shell off a raw egg and then immerse it in colored corn syrup or water. A jar full of these would make a spooky Halloween centerpiece! Science and history meet in this witchy spin on a simple and classic density experiment. Learn how bread rises as you watch your bubbly yeast mixture inflate a balloon! With trick-or-treating coming up, you are sure to have extra candy lying around the house for weeks! How about using some of that candy for science? Engage the kids in colorful candy chromatography, make “Ghost M’s”, and see how different solvents dissolve each candy. Not all liquids are created equal. Some are more dense than others and some have properties that won’t allow them to mix with other liquids. 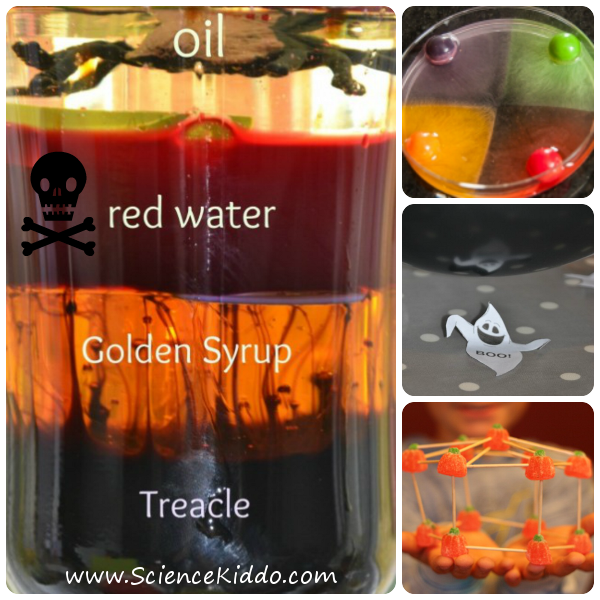 Make your own density jar with a spooky Halloween twist to observe the differences. Experience static electricity firsthand by making a family of ghosts jump and dance! Get your STEM on by seeing what kinds of structures you can create using candy pumpkins and toothpicks! Have a very spooky and scientific Halloween! Crystal is a homeschooling mom of two blondies. After giving up an academic career in chemistry to stay home with her kids she launched The Science Kiddo to focus on doing science experiments with her children. She blogs about kid science activities, early childhood science education, homeschool, and raising independent thinkers and strong leaders. How fun – thanks Crystal for sharing! These are great ideas for hands on science! Thanks for the heads up! Heading over now.